The General is a biographical crime drama focusing on the life of Martin Cahill, an Irish criminal who pulled off a string of heists throughout the 1980's, becoming a contemporary Robin Hood-type figure on the Emerald Isle, attracting the attentions of the IRA and similar politically-motivated factions. Brendan Gleeson delivers an excellent performance in the lead, whilst John Boorman's black and white approach gives the material a lot of gritty realism. Ultimately, it's a very bleak piece of filmmaking, but the excellent lead performance and execution of the story make it eminently watchable. 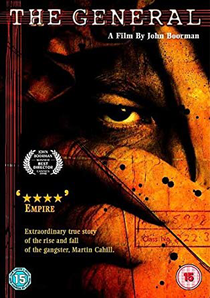 The 2000 film Ordinary Decent Criminal was also intended to have Martin Cahill as its principal focus, but names were changed to differentiate it from this film.